I was born in Poland and began my musical training at the age of 6 on piano and transitioned to the violin at age 10. I received a Bachelor of Music degree from the Conservatory in Bytom and a Master's Degree in Arts from the prestigious Karol Szymanowski Academy of Music in Katowice. My teachers included distinguished artists Janusz Skramlik, Stanislaw Lewandowski and Aureli Blaszczok. Other teachers include Sylvia Rosenberg (NYC), Daniel Heifetz, Arnold Steinhardt, John Dalley, the Guarneri Quartet (University of Maryland), as well as the Fine Arts Quartet (Chamber Music Institute, Milwaukee). Since joining the Penderecki Quartet in 1987, I’ve been actively performing with my colleagues throughout Canada, Europe, Asia and North and South America. My recent solo performances include recitals and appearances with the K-W and Peterborough Symphony Orchestras. 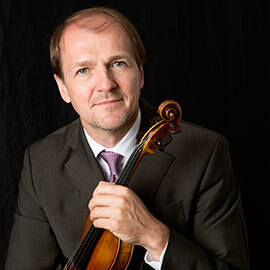 My solo recording, “Music of Karol Szymanowski” was described by the Strad magazine as “an outstanding release”. I have also released over 2 dozen CDs (Marquis, Eclectra, CBC, CMC, EMI labels), including an acclaimed recording of the complete string quartets of Béla Bartók with the PSQ and Arnold Schoenberg's Pierrot Lunaire with the Blue Rider Ensemble. My chamber music partners have included pianists Janina Fialkowska, Francine Kay, Vladimir Feltsman, Lev Natochenny, Jamie Parker, Stéphan Sylvestre, cellist Tsuyoshi Tsutsumi, clarinetist James Campbell and others. I have been teaching at Laurier since 1991 with enthusiasm and excitement. It is absolutely wonderful to be part of the transformation of our talented students from young musicians to true artists, future music educators and therapists. In my studio, my teaching philosophy is a blend of the Russian/Polish School with influences of Ivan Galamian, Paul Rolland and Mimi Zweig string pedagogy. I strongly emphasize physical freedom so the students have no limitations in expressing music and finding their individual and unique voice. Exoticism - The Music of Karol Szymanowski (Marquis Classics 2014) with Stephan Sylvestre – piano. Ludwig van Beethoven, String Quartets Op.132 and 135, (Marquis Classics 2013) with Penderecki Quartet. Bela Bartok, Complete String Quartets, (Eclectra Records 2006) with Penderecki Quartet. Marjan Mozetich’s “Lament in the Trampled Garden” with Penderecki Quartet, 2010 JUNO Award for Best Composition.